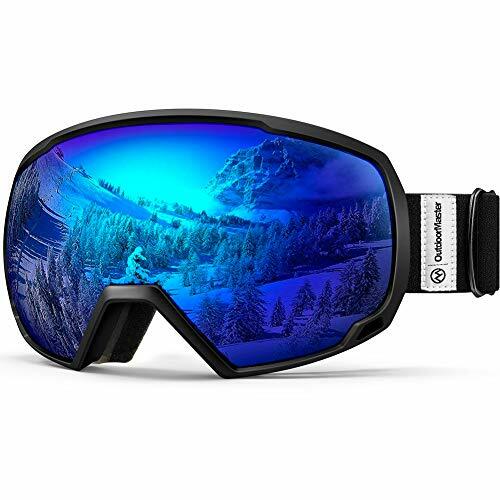 Snowboarding goggles provide wraparound protection for your eyes when snowboarding. When hitting your favorite slope, these are an essential piece of kit. As well as helping to shield your eyes from the bright bounce back of sun on snow, they provide UV protection. We reviewed dozens of pairs of snowboarding goggles to find the best of the best. We looked at features such as the amount of light filtered through the lenses, anti-fog coatings, and helmet compatibility. These stylish, spherical goggles offer the ability to remove and replace the lens for different light conditions. For our top pick, we selected the Zionor X4 Snowboard Goggles. Featuring a shperical, removable lens, these provide 180+ degree vision plus a high level of UV protection. The Zionor X4 Snowboard Goggles take our top pick spot thanks to their huge range of features combined with an excellent price point. These goggles feature a spherical design which provides over 180 degree field of vision. This is combined with a dual layer lens which allows the outer lens to be removed. This allows you to change lenses should you be snowboarding in conditions with very different light levels. The optimized vent channels within the frame of these goggles helps to increase airflow and reduce fogging. This is combined with a flexible yet durable TPU frame, which is lined with a soft sponge. The elastic strap contains silicon strips, designed to prevent slipping. Perfect for glasses wearers, these goggles include excellent optical clarity, and anti-fog lenses. As our runner up pick, we selected the OutdoorMaster OTG Snowboard Goggles. These are a perfect choice for glasses wearers, as the Over-The-Glasses design means you can achieve a perfect fit without compromising on comfort. The dual layer lens technology provides an anti-fog inner lens for fog-free snowboarding. The extra long elastic strap of these goggles is designed to be compatible with all types of snowboarding helmets. OutdoorMaster provide a choice of 10 lenses, along with recommendations of which lens suits which weather condition the best. These snowboard goggles offer a huge range of features at a very competitive price. For our budget pick, we selected the Zionor X10 Snowboard Goggles. Coming in at just $14.99, these snowboard goggles still offer a great range of quality features. Available in a choice of 9 different lens types to suit all light conditions, the advanced lens coating provides UV protection as well as anti-fog capabilities. The rugged lenses use Zionor’s Enhanced Durability Tech (EDT) for excellent impact resistance in the case of a fall. There are many happy reviews for these goggles on Amazon, with customers pleased with the combination of value for money and an excellent product. This premium women’s snowboarding goggles provide excellent anti-fog performance, as well as polarized lenses. If you’re looking for the best women’s snowboarding goggles, we suggest the CPPOZZ G1 Snowboarding Goggles. These goggles have been recently upgraded and now provide twice the anti-fog performance of previous models. As well as providing 100% UV protection, they are suitable for use over glasses. There is a huge range of lenses to choose from, suitable for all snowboarding conditions. Each of these provides excellent optical clarity. The premium, TPU frame provides both comfort and support. These stylish snowboarding goggles offer a classic design combined with state of the art technology. 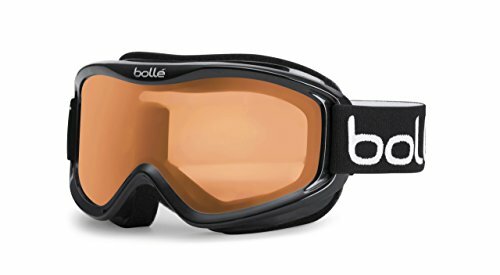 For our best men’s snowboarding goggles, we recommend the Bolle Mojo Snowboarding Goggles. These goggles have a classic design, and throwback styling. Don’t be fooled by their appearance though, as they also include advanced lens technology for amazing performance. The flow-tech venting is designed to help optimize the airflow over the lens, which reduces fogging. The double lens places a thermal barrier between the cold air outside, and your body heat. This helps to prevent condensation from forming, keeping your goggles clearer for longer. If you spend any time at all snowboarding during the winter, you’ll find snowboarding goggles an invaluable piece of kit. As well as protecting your eyes from the harsh effects of sun on snow, they protect your eyes from wind, branches, and snow particles thrown up by other snowboarders. Ski and snowboard goggles are very often interchangeable, so you might also like to head over to our review of the best ski goggles to find some alternative options not included here. Helmet compatibility. Many of us choose to wear a helmet while snowboarding. If you do too, then look out for snowboarding goggles which are compatible with wearing over a helmet. These usually have longer straps, backed with silicon strips to grip your helmet and prevent slipping. Polarized lenses. Some snowboarders prefer polarized lenses, as they can help reduce the glare of sun bouncing off snow. They do disguise icy patches though, so depending on which conditions you snowboard in, you may or may not prefer this option. Visible Light Transmission (VLT). Different snowboard googles will have different VLT ratings, and it’s important to select one which suits your needs. The lower the VLT percentage, the less light will be transmitted through the lens. VLT percentages are split into 5 categories. A google in Category 4 transmits less than 8% of visible light. This makes it suitable for sunny, clear weather. At the other end of the scale, a google in Category 0 transmits 80 – 99% of visible light, meaning it’s best suited to night snowboarding. What are snowboard goggles and how do they work? Snowboard googles are large goggles, which wrap around the top half of your face. They’re usually secured using elastic around the back of your head. They work by providing your eyes with protection from the harsh conditions that can be found when snowboarding. This includes glare from the sun reflecting off the snow, small particles of snow or grit in the air, wind, tree branches… the list goes on! Do I need snowboard goggles? In short, yes. Many snowboarders agree that goggles are one of the essential items of kit you shouldn’t be without. What is the best color lens for snowboard goggles? This depends on a range of factors such as the weather, and time of day you’ll be snowboarding. As we covered earlier, snowboarding goggles are available with a range of different VLT percentages. For very bright, sunny conditions, you’ll want a lower VLT percentage. Many goggles are a pink, yellow or orange color. These shades help to increase contrast, so you’re more likely to see bumps or rough patches in the snow. Why do my snowboard goggles fog up? This can be due to the difference in temperature between your body, and the cool outside air. The warm air condenses into small water droplets which can fog your lens. The majority of snowboarding goggles nowadays have dual lenses, which create a thermal barrier to prevent fogging. Make sure to select goggles with an anti-fog coating as well. We looked at 20 other pairs of snowboarding goggles. Even though they didn’t make our 5 best snowboarding goggles, they’re the best of the rest and each is a great choice for when you hit the slopes. The information you’ll need to compare each one is included with the listing. These goggles feature a stylish and bold floral design on the elastic strap. These snowboarding goggles are perfect for wearing over your existing glasses. These goggles feature a quick change magnetic lens system, with a clip lock for added security. These goggles feature an elegant, understated style perfect for cruising the slopes in style. 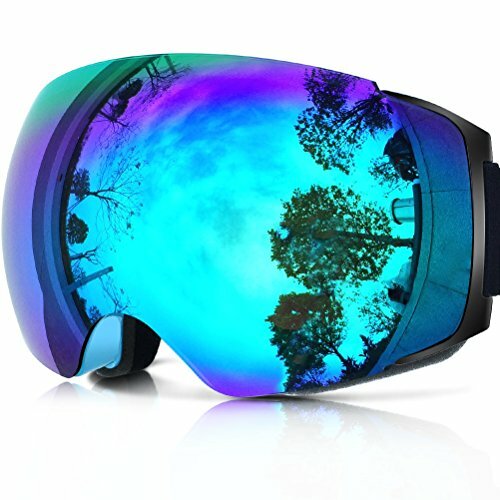 These snowboarding goggles offer a wide range of 11 different lens colors, suitable for all light and weather conditions. 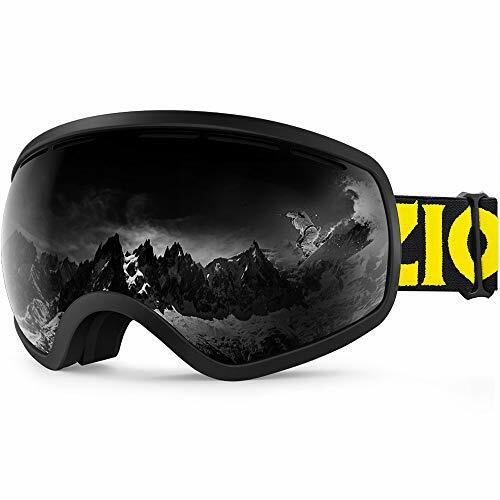 These snowboarding goggles come with a free set of yellow lenses for low-light snowboarding. These large goggles provide a wide range of vision and are available with 18 different lens colors. 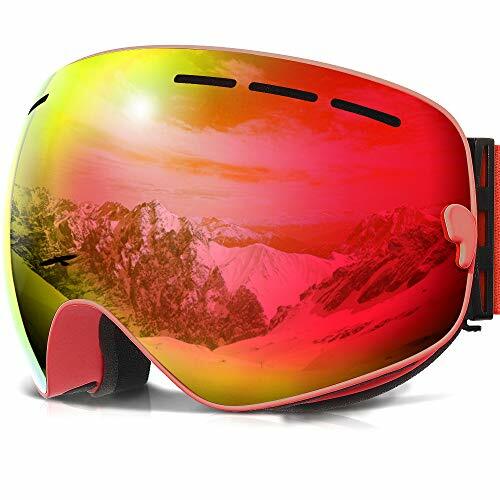 This fashionable rimless design of these goggles also gives you an unobstructed view of the mountain. These versatile goggles are OTG and helmet compatible. These goggles offer the choice of a polarized lens, which can help reduce the bounce back of sun on snow. These AKASO snowboarding goggles are specifically designed and shaped to fit kids, youth and teenagers. These COPOZZ snowboarding goggles offer the same features as the adult model, but with a specific design to suit ages 2 – 12. The small frame size of this goggle is suitable for toddlers and upwards. These helmet compatible snow goggles are suitable for children aged 6 and up. The dedicated mini design of these Zionor goggles is perfect for youth and kids. The extra large spherical lens of these goggles is perfect to wear over glasses. The soft, triple sponge layer of these goggles is designed to fit perfectly around your glasses. These OTG goggles are specifically designed for the female face. The detachable lens system of these OTG goggles means yuo can change lenses depending on weather and light conditions. These goggles provide a panoramic view thanks to their spherical, streamlined design.